Episode 011 DARK HUMOR - Peter Revello: "The Holocaust--not great, ok?" – Let's Talk About Sets! Episode 011 DARK HUMOR - Peter Revello: "The Holocaust--not great, ok?" Fantastic stand up comic and writer Peter Revello is the perfect guest to theorize about dark humor. This episode is all about dark, black humor. What is it? What purpose does it serve? How is it distinct from “blue” humor, and how do the two work together? How does it relate to “punching down?” Dark humor isn’t for everyone; but comics, in particular, tend to love it. And this episode definitely showcases that dark affinity for salving the tough parts of life with a hearty laugh at bad things. It’s fair to say that this episode lends itself to some exploratory debate; so if you love nerding out about how humor works, you’ll love this. Peter Revello is a stand up comic hailing from the venerable borough of Staten Island. 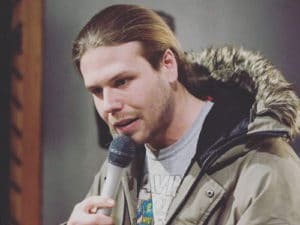 He’s a deep-thinking guy with degree in philosophy, and he’s actually the only person on the planet putting a degree like that to use outside of a university, which he does as one of the sharpest comedy writers with whom the hosts have had the pleasure of engaging. When Peter gets on stage, comedians shut their notebooks and listen. As a laid-back guy, whose easy delivery and gentle demeanor softens his razor wit and insight, you just don’t see it coming. 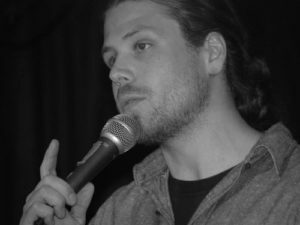 He performs all over New York City, including New York Comedy Club, Broadway Comedy Club, the Creek and the Cave, and Tribeca Comedy Lounge. Special thanks to George Carlin, Anthony Jeselnik, and Louis CK. And, as always, a toast to Salt N’ Peppa for continuing to either be unaware of our fair use or not caring about it, given that we make negative money producing this show. Bless them! And a very, very special thanks to Dr. Benjamin Cerf, who uses his Doctorate of Economics to convince his best friend which parts of this podcast are boring, and would therefore reduce consumer demand.